Can we use the Creative mind beyond the making and enjoying of Art? How can your mind influence things that drop to flips butter-side up? How can one successfully take on the heavy task of fitting into an environment (and indeed Life as a whole) while enjoying a pleasant, involved and rewarding Lifestyle? Our understanding is that all of us are able and should be willing to dedicate some of our mind to bettering Humanity's relationship with Nature. The ButterSide theory is to call upon the Creative Mind and use it as a lens through which we can observe the design of our evolving Human culture and as a tool to compose and elaborate. The ButterSide rests on a stable foundation of thinkers, builders, educators, artists and elders trusting their individual and collective worth and ability to serve the common good. In other words, beyond creativity resides a sense of responsibility and accountability that the ButterSide has been committed to. This translates into the application of acquired skills and the referral to knowledgeable partners and principles, in an effort to support personal and community development. Our actions take the form of consultations, design preparation and natural building services and workshops. Call on the ButterSide to assist you in private or community projects as well as to participate in learning opportunities year round. On the edge of the Jungle of Waitukubuli (the Indigenous Kalinago name for our island), We are building a palace of wonders to connect, share and Learn together. While we watch Time fly by, there is a way to keep up with activities on the Butterside of Life. There is an ongoing volunteer program and a number of workshops take place while we are in the process of building the center. Click here to Take a trip on our Instagram page, to follow the progress on the Family Tree homestead and R&D institute in Eden Heights, Dominica. and see what is on our calendar. This is a glimpse of the 2016 Family Tree Intensive Permaculture Design Certification course. The course happened in Waitukubuli (a.k.a. the Commonwealth of Dominica), and was led by Papillon (the Butterside) and Mike Wird (Regenerative Lifestyles). The Family Tree Wellness team is following Fatoumia Oumar Ribier's lead and taking a deep dive into the Mind and Body. 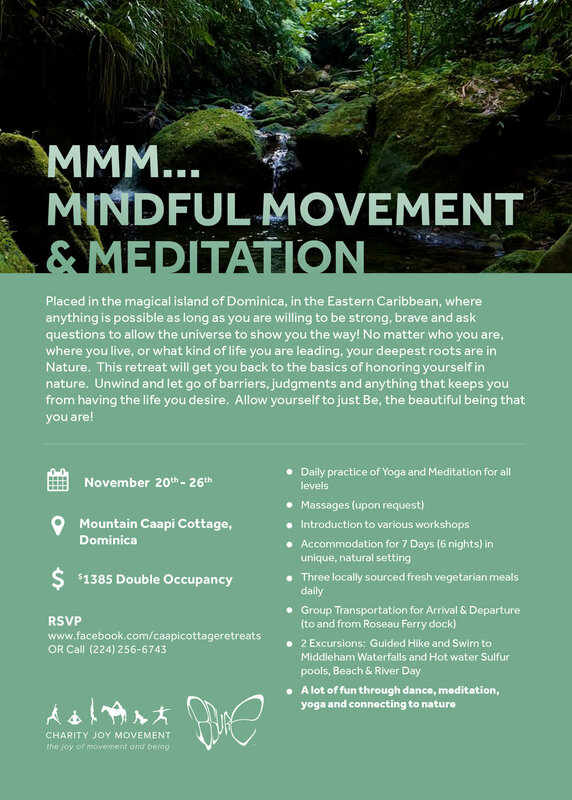 In collaboration with Charity Joy Robinson and Jessica Canham, she is orchestrating a delightful retreat on the fantastic "Nature Island" of Dominica. If you want to learn more about this event, click here. Here we go again! 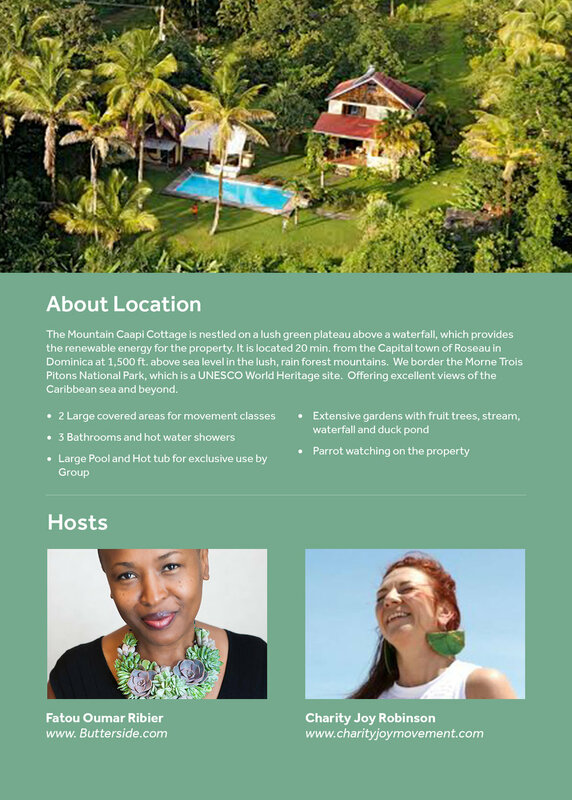 The Butterside Family Tree is having another PDC in Dominica with Regenerative Lifestyles from Colorado and local environmental actors! Save the date: December 11th through 22nd 2017. This is a 10 day intensive course, covering the Permaculture curriculum in a most enchanting context. After a successful course last year, we decided to pull people and resources back together to dedicate 2 weeks to transmission of positive regenerative practices. Following the teachings of Bill Mollison as well as the Natural Farming philosophy of Masanobu Fukuoka, we are excited to welcome local and international students to grow and share knowledge and skills this December. 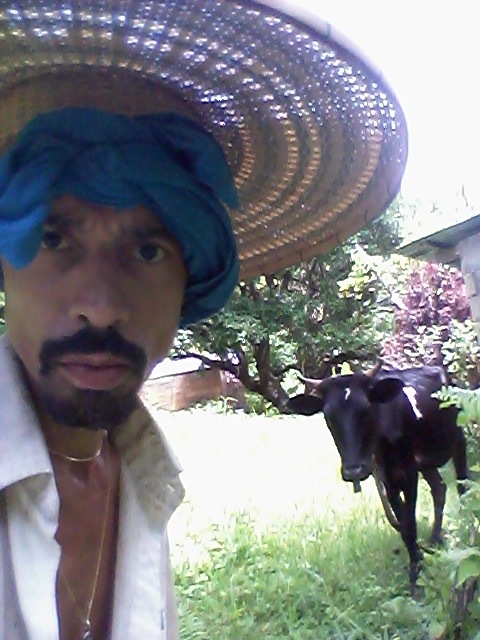 The course shall be facilitated and hosted by Michael White (most commonly known as Mike Wird) and Papillon Ribier, dedicated Permaculture teachers, Earthship and Natural builders, Nature-loving artists and committed fathers. Yes, them again! It went so well last year that we had to do it again. This time, the addition to the team is the strength and knowledge of their respective partners: Robin Eden White (also a Permaculture instructor) and Fatoumia Oumar Ribier (a Yoga instructor and Life coach). A number of other speakers and local environmentalists will also be participating in the experience. As you may have observed, our Human presence on the planet has become a little costly to the biosphere as a whole and chances are, it doesn't have to be that way. So, with this intensive course, we are determined to pass on as much data and love to strong groups of community-leading individuals. This edition of a PDC is designed as an Environmental as well as Social course, to serve the purpose of our planet, faced with the challenges of a culture so influential and omnipresent as Human culture has grown to be. In other words: come prepared to discuss Reality. This one is not for the faint of Heart. We believe in the benefit and true impact of regenerative practices and if our species has been able to leave a geological mark on our Mother Earth, there is no reason the same species could not reverse the wrongs it has done and heal the planet that birthed it. Wouldn't you agree? It will demand a few efforts, but nothing we cannot handle, right? Click here for more details and you will be able to register online. If that's not enough, please contact us for more information. Surrounded by a community of forward thinking people, the ButterSide has developed a solid crew and lasting partnerships. As a result, we are called upon to observe ecosystems and developing projects to assist in identifying sustainable and regenerative relationships and potential, enabling the design of a harmoniously balanced organization. One of the ButterSide's favorite missions: taking a cluster of ideas and limitations to extract a relevant and efficient design. Bio-mimicry and Permaculture principles are at the core of our process. We aim to create a layout that results in every given element landing butter-side up in a coherent configuration, offering an efficient closed-loop system, minimizing external needs and the output of pollution. Hands-on. Building is the natural outcome of an approved design. Our philosophy is to experiment with new technologies while finding out footing and inspiration in ancient and verified techniques. Beyond simply implementing blueprints, the ButterSide involves clients, students and hobbyists in the act of building. 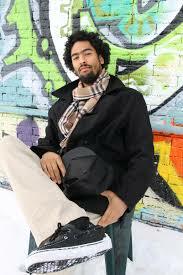 The emphasis is put on assimilating principles and grasping the physical reality of a mental concept. Collaborating with the village of Kani Kombole in Dogon country, Mali. Addressing the issues of deforestation, overgrazing and drought in the Sahel region. Natural Building with Earthen Hand & Regenerative Lifestyle. 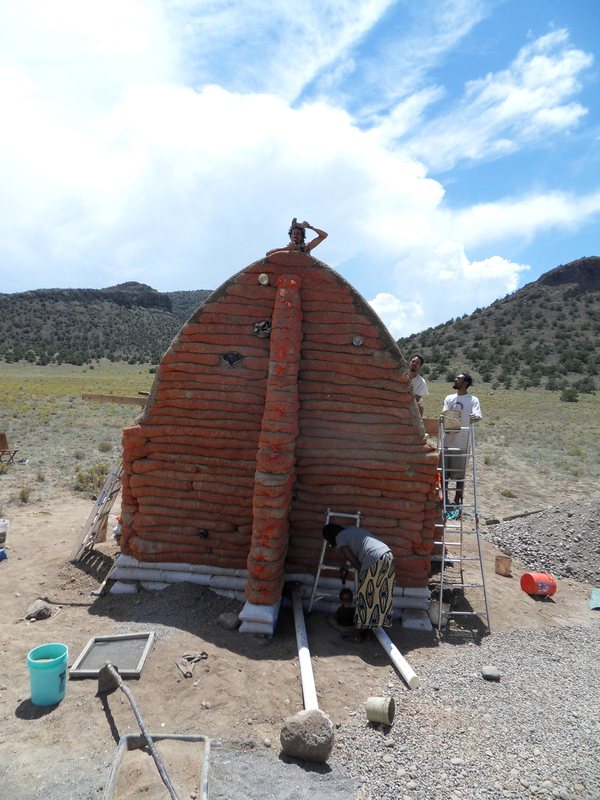 Papillon hammering the last bamboo stake in this hyperadobe wall of a Nubian vault construction in La Garita, Colorado. Find out more about our work and philosophy in this article about one of Butterside's own: Mike Wird.